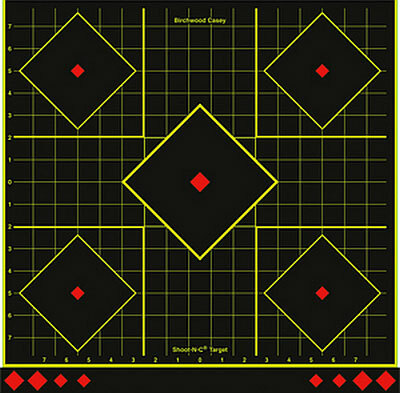 Birchwood Casey has just introduced a super-sized grid target that should work great at 250 yards and beyond. The new Shoot-N-C “Sight-In” target, 17.75″ on a side, features five (5) red aiming points inside large, yellow-edged diamonds. The background is a grid of 1″ squares with a larger cross outlined in heavy yellow lines. The accurately-sized grid pattern makes it easy to estimate your groups (and adjust your scope to center point of impact). Even if shots fall inside the large, black diamond zones without grid lines, you easily make a quick correction using the nearby grid markings. As with other Shoot-N-C “splatter” targets, this big 17.75″ target produces a bright, highly-visible yellow ring around each bullet hole. In most conditions, with a 25-power or greater scope, we can see bullet holes at 600 yards using this kind of target. You can buy a lot of these targets for the cost of a target cam — something that might be otherwise required to see bullet holes reliably beyond 500 yards. Birchwood Casey also recommends this target for sighting in. We can see how that might be useful if you have very low-power riflescope or no spotting scope. Again, the handy grid pattern lets you dial your correction with precision, which should speed up the sight-in process. After sighting-in, if you have a very accurate rifle, this may not be the best choice of target at 100 and 200 yards. A half-inch group will just create a big yellow blob, and it may be difficult to distinguish single bullet holes. But at longer ranges, even the most accurate rifles will normally produce large enough groups that you can see individual shot placements (with black separating yellow splatter rings). 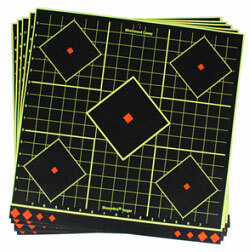 Shoot-N-C 17.75” Sight-In Targets come in packs of five targets, with 85 stick-on pasters. There are red diamond pasters (for additional aiming points) and black pasters to cover shot marks. MSRP for the 5-pack is $25.30, but many vendors are selling the 5-pack for under $17.00. The lowest price we found was $11.89 at www.bigsupplyshop.com. Share the post "New 17.75″ Shoot-N-C Grid Target with Five Aim Points"
Would like silhouette targets in Shot-N-C. 1/2 size to start with.